Because we had B later than most couples we know, B only has a few baby friends who are close in age. Emma is one of her friends who happens to live close by, making play dates fun and convenient. Big sister Elizabeth has great affection for B, resulting in many kisses and hugs for baby B.
Emma's first word was the name of her neighbour's cat and hence, the cat themed first birthday cake was chosen my mom and dad. 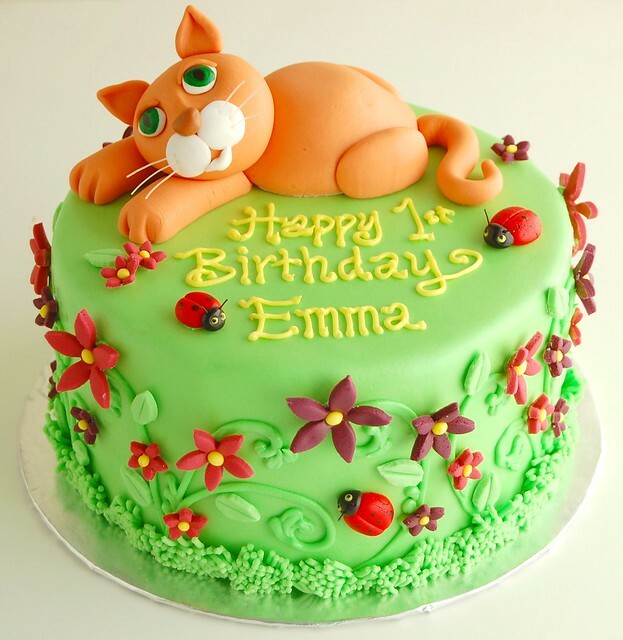 Honestly, I designed the cat cake with Elizabeth in mind since Emma really has no clue about cake at her young age. I wanted the design to be bright and feminine but not overly precious and girly. An orange cat was appropriate because Emma is currently a red head, with beautiful silky hair. Admittedly, I am somewhat jealous of babies with thick long locks of hair because poor B has a sparse head of oddly distributed hair, with a short fine spiky top and pseudo-mullet in the back. It is merely a pseudo-mullet because the longer hair only occurs laterally by the back of her ears and not across the nape of her neck! 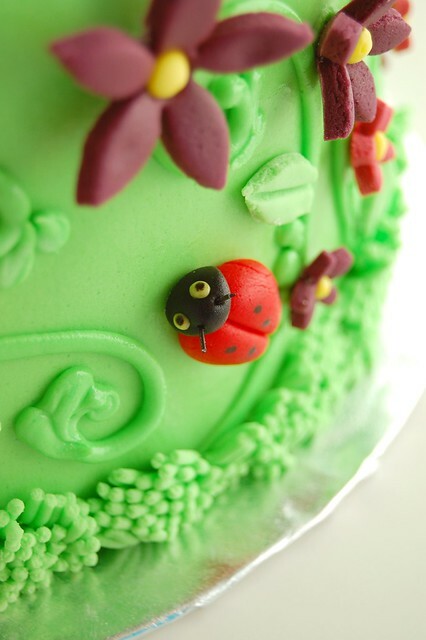 I could not resist adding ladybugs to the cake because who doesn't like ladybugs? Inside, chocolate cake and 64% dark chocolate mousse were enjoyed by all. In fact, high praise was given by big sister Elizabeth who concluded that "Charmaine is a good maker of cake". I am humbled by your kind words, Elizabeth. Happy Birthday Emma! Posted by Charmaine at 2:19 p.m.
September 3, 2012 at 5:52 p.m.
You are extrememly talented! 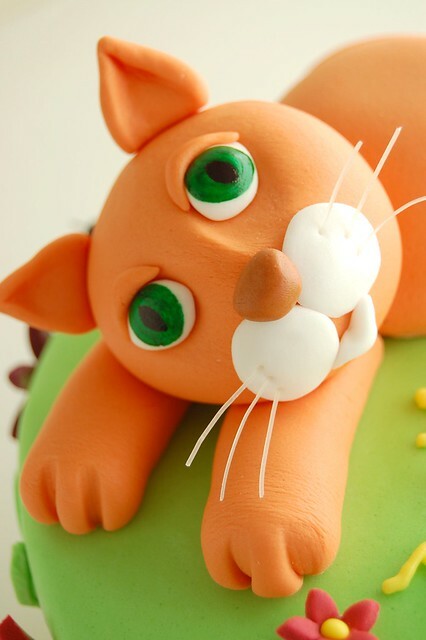 This kitty birthday cake is precious, and the display wedding cake a few posts down is perfectly gorgeous. Keep up the great work! September 3, 2012 at 6:30 p.m. I cant explain how beautifully u had presented this, it looks just stunning will its colors & floral work. October 24, 2012 at 6:49 a.m.
February 26, 2013 at 9:19 a.m.